This list of fantastic gift ideas for your geek brother is sure to help you find the perfect gift. This air-conditioned motorcycle helmet protects your head and ensures a comfortable ride. It is the first helmet of its kind that has been made available to the public. This coding robot has been designed for children. It is a learning device that teaches kids about coding. This funny mug is sure to amuse anyone who fixes things. Anyone who works with electronics is sure to appreciate the humor. These socks are a fun novelty gift idea. Perfect for anyone who is interested in or works with computers. Anyone who is good with computers is often the go-to friend or family member when some have a computer problem. This funny mug lets everyone know that you won't be fixing their computers. This deck of cards is officially licensed PAC-MAN merchandise. A very cool gift idea for any fan of retro gaming. This painted party shock game is a lot of fun. It can be played by two or more players and is a cool game to play at parties or get-togethers. This keyboard is designed for gamers that only need to use particular keys. It's handy because you can place the half of the keyboard that you don't need out of the way. This means you will have more space and more room to play. This handy little robot constantly updates and learns new things. The robot is voice activated and can perform tasks such as taking pictures, answering questions, setting alarms and more. This interactive kit teaches children how coding works. Users can build their own computer and complete educational challenges. If you have a geek brother that is passionate about language or grammar then this shirt is a cool gift idea. It comes in many different sizes and colors. This is the perfect birthday gift for your favorite gamer. It comes in eleven different colors and is comfortable to wear. This cool birthday card is the perfect card for any gamer celebrating a birthday. The design features a controller and birthday wishes. Every geek needs a way to transport their technology safely. This backpack is designed to carry a laptop and/or a tablet safely. If your geek brother also happens to play the guitar then this is pretty much the perfect gift. It is a set of six black guitar picks featuring a gold CPU design. Anyone who believes that aliens exist or that they might will love these. This set of cufflinks is fun and it features two bright aliens. This cool Star Wars toaster is sure to impress any Star Wars Fan. 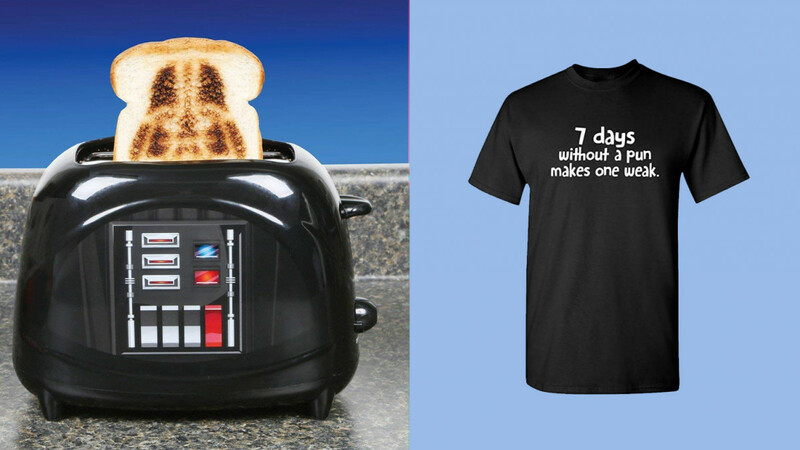 It burns an image of Darth Vader into your toast. Any scientist or student is sure to like this cute joke. This shirt is available in lots of sizes and ten different colors. Any retro gaming fan is sure to recognize the Super Mario mushroom. This is a great lamp to use on a desk, bedside table or side table. If you have a brother who likes to experiment then this funny shirt is perfect. Lots of colors and sizes to choose from. If you have a brother that is also a Father and a gamer then this has got to be the perfect gift idea. Your brother will love this mug if he considers himself to be a bit of an intellectual badass. A very funny gift idea.